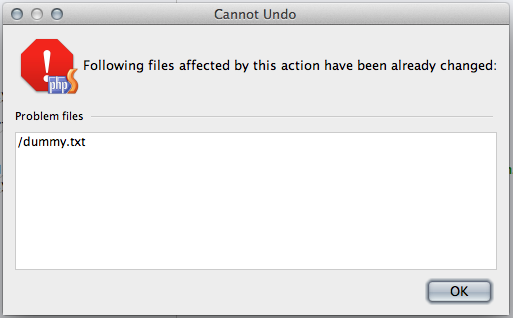 Not sure what the issue is here, but file undo history is extremely tempremental. I'll make some changes, save, review my changes, come back, and if I try and undo I get the attached error. Any ideas what could cause this? Running the latest version of PhpStorm on Mac Mountain Lion. Tom, do you use PhpStorm 5.0.4? Could you please try the latest EAP build #126.399? The bug IDEA-92378 is fixed in this build. You don't need to remove v.5 from your machine to install EAP build. During the installation you will be asked about importing your settings from version 5. After that the settings will be stored in the separate folder for each IDE version. One small caution is to backup the .idea folders in your projects. You can use these folders later if you'd like to return to version 5.